To stay steps ahead of the FDA’s menu-labeling mandate, now delayed until May 2017, North Carolina State University began re-evaluating items at its 37 foodservice locations last year, says Lisa Eberhart, director of nutrition and wellness for the 34,000-student school. “Although we’ve always been transparent and very clued-in to health, calorie counts are a big focus now because of menu labeling,” the Raleigh, N.C., operator says. Sodium reduction also is on top of Eberhart’s punch list. 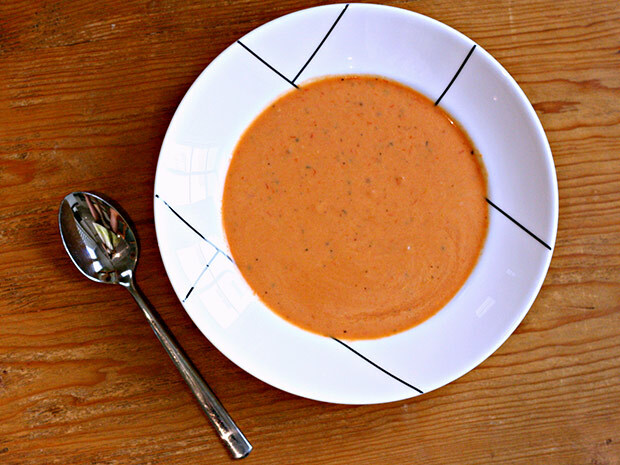 With the immediate goal of making 10 of N.C. State’s best-sellers 10% healthier, including this tomato bisque, Eberhart teamed up the university’s dietary interns with campus chefs. One goal was to revamp the tomato bisque into a vegetarian version that would appeal to a larger group of diners. 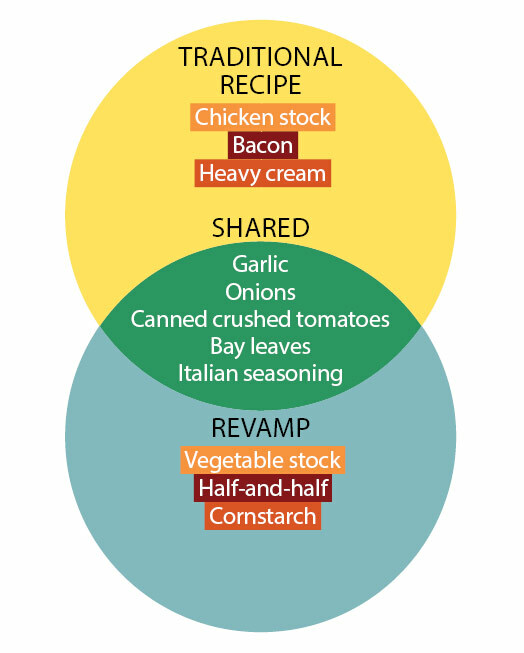 The original chicken base was swapped for vegetable stock, and bacon in the old recipe was omitted. “Eliminating the bacon saves minimal calories, but it makes the soup vegetarian and lower in sodium,” says Eberhart. Chefs automatically use salt and pepper at every stage of the cooking process, but when a recipe has high-sodium ingredients—soy sauce, Worcestershire, canned tomatoes, even hot sauce—it’s better to “salt to taste” at the very end, says Eberhart. The garlic, bay leaves and Italian seasoning make up for lower salt content. The team substituted an equal quantity of half-and-half for the cream—a savings of about 35 calories per serving—and a slurry of cornstarch and water thickens the soup to its formerly creamy consistency.